You've probably have already heard (see my "news" article here) that Dior has revamped their lip gloss line with a new formula, new packaging and new shades - Dior Addict Ultra Gloss. There are 18 shades available with either a syrup, shimmer or iridescent finish. 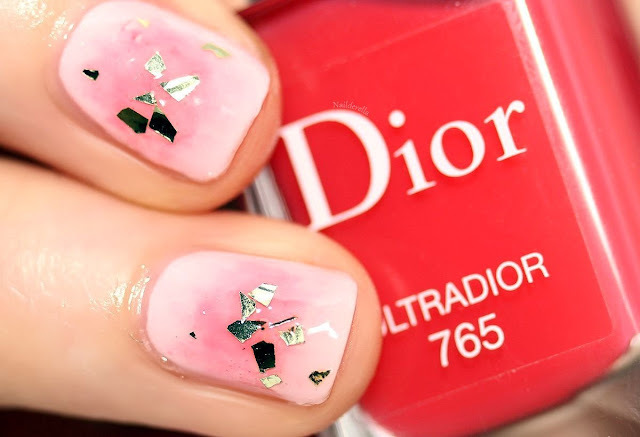 Three new nail polishes are also joining the game and each nail polish is supposed to represent each different 'finish' of the new Dior Ultra Glosses. Let's start with the nail polishes. I got 2 out of the 3: Ultadior (jelly-syrup finish) and Cruise (shimmery finish). Ulatradior is a gorgeous hot pink jelly nail polish. It really has a syrup finish and looks delicious, doesn't it? That's a great summer shade, especially if you don't want something too "heavy" on your nails. For the swatches below I used 3 coats. By the way, when I saw this polish it immediately reminded me of the "cheek nails" trend. It's a very popular nail art technique in Japan where you kind of blush your nails. It's also popular in Korea. I'm not 100% sure where exactly the trend started from. Basically you start with a light base color that you apply all over your nails. Then take a sponge and a pink jelly nail polish, and dab the polish in the center of your nails to create a gradient. Finally add some glitters or flakies in the center of the nails. I used Dior Tutu, Ultradior and Diorific Golden Shock Gold Leaf top coat. Cruise is a cool-toned pink with large golden and smaller silver flecks, and pink shimmer. It's a very complex and unique polish! Absolutely love it! Ultra-Plumping: +14% immediate volume. Its plumping formula gives lips a supple, plump shape bursting with freshness . Ultra-glossy: 97% of women say, lips are glossed with an incredibly thin and easy-wearing mirror-shine film. Ultra-hydrating: 6 hours of continuous, deep moisturisation - for smoothed, plumped lips. This new generation of gloss by Dior is a combination of a lip plumper (volume) and gloss (shine) and importantly it is not sticky. Compared to the old formula, I think the new one is more moisturizing. The first impression I have when I put it on is "wow its fells so comfortable and moisturizing"! And yes, I confirm that it is not sticky. The shade I have is 765 Ultradior. It's a gorgeous fuchsia shimmery gloss. The color is just perfect, it makes the lips super fresh and healthy and this is the kind of colors that look great on almost all skin tones. It also very glossy and makes the lips fuller. Very important point, it's not sticky. Honestly, I'm usually not a gloss girl, I prefer lipsticks or lip tints. But I have to admit that this new gloss made me change my mind - completely. I've already worn it more than I thought I would, almost every day this week!! It's so comfortable and as I said, really moisturizing. In fact, when I put it on, I have the impression I'm using a lip treatment as it's so moisturizing. Am I the only one who has this impression? Moreover, the color of Ultradior is beyond gorgeous! I'm in love. The only con is that it doesn't last very long (but that's something common with all lip glosses), about 2 hours. If you're looking for an excellent lip gloss, I highly recommend this one. I can confidently say that you won't regret. On the contrary, if you're not into lip gloss, you should check it out because it could well make you change your mind about lip glosses!